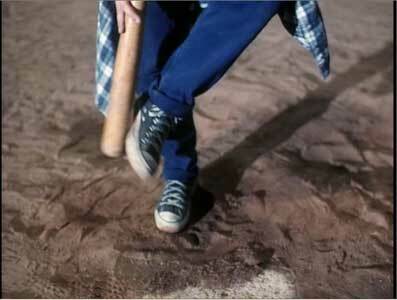 Trevor Lissauer and Shanelle Workman wear black and red high top Converse “Chuck Taylor” All Stars in the film. Zack watches his dad do the weather forecast on the local cable station. The Skateboard Kid is about a teenaged skateboard fanatic named Zack (Trevor Lissauer) who moves from Los Angeles to Mill Creek, a small town in the middle of nowhere because his dad Frank (Timothy Busfield) has gotten a new job as manager of the local cable television station. Bored with his new life because there isn’t much to do, his dad has no time to spend with him due to the demands of his job, and he has no other family, Zack tries to make friends with some of the other skateboarders in Mill Creek. But they are part of a gang run by Ham (Jonathon Pekar) the arrogant son of Big Dan (Cliff DeYoung) the local used car dealer, and financial power in the town, and want nothing to do with Zack. The only people in town who are friendly to Zack are Maggie (Bess Armstrong), owner of a struggling antique store located next to the used car lot, and her daughter Jenny (Shanelle Workman), who Zack is able to help out early in the film. A frustrated Zack surveys his broken skateboard. When Big Dan’s sidekick Earl breaks Zack’s skateboard, Maggie gives him an old skateboard she has in her shop that once belonged to a magician. Zack takes the board back to his garage and works hard to restore it, even adding a motorized component to it. When lightning strikes the skateboard, it becomes alive, turning into Rip (voice of Dom DeLuise), a wise cracking personality who becomes Zack’s confidant and helps him fight against the skateboard gang who are continually trying to take him down. 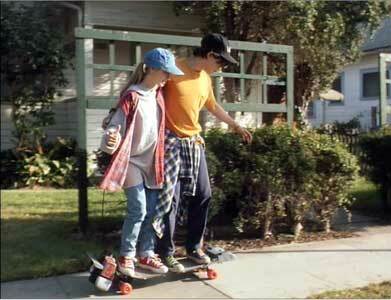 Zack and Jenny go for a ride on Rip, his new skateboard. The plot thickens as a triangle develops between Frank, Maggie, and Big Dan. Big Dan wants to marry Maggie, because he wants to take over the land where her store is, where he thinks a missing treasure is buried. Maggie isn’t sure about Dan, and is still grieving over her recently deceased husband, but is on the verge of bankruptcy and needs the financial help Dan can provide. But when she meets Frank, some sparks fly. After Dan discovers that Frank is a potential rival, he quickly tries to force a marriage to take over her property. Luckily, Zack overhears Dan and Earl plotting, and is able to steal the treasure map that proves Dan’s true intentions. In one of many chase sequences, Ham tries to destroy Rip and injure Zack. 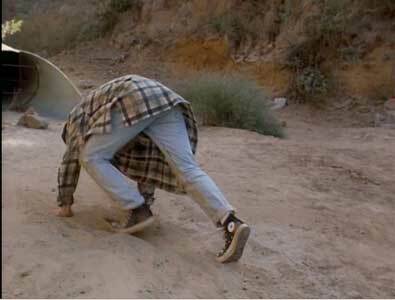 Zack struggles to get up after being knocked off the side of the road. 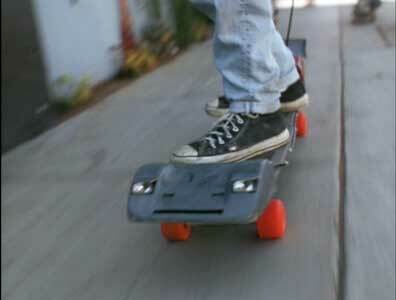 The Skateboard Kid has a predictable storyline, with too many convenient coincidences. For example, each family consists of a single parent and single child, so there can be a love triangle at the adult level, and conflict between the kids at the same time. Frank-Zack and Maggie-Jenny are the “good” families while Dan-Ham are the “bad”; family, a convenient generational device maybe used to prove the old adage “like father, like son” (or “like mother, like daughter”). Clearly the point of this film was to show a series of skateboarding action sequences and stunts, within the facade of the thin story. There really isn’t any attempt at character development, except for one scene where some of the details of Zack’s and Jenny’s family backgrounds are revealed after Zack finds Jenny checking out Rip in his garage. Still, the film has its enjoyable moments, if you can buy into the fantasy it represents. Zack becomes an All Star batter. Rip takes Zack for a ride through the town. 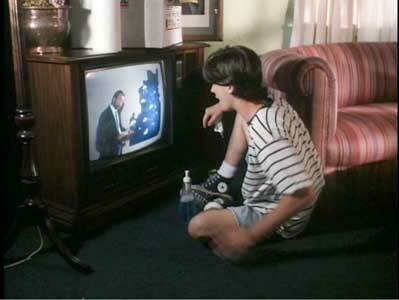 The highlight of The Skateboard Kid is the great series of chucks shots throughout the film. With its focus on skateboarding, Zack’s black high top chucks are shown in closeup on a number of occasions, appear in almost all of the action sequences, and are constantly on screen. 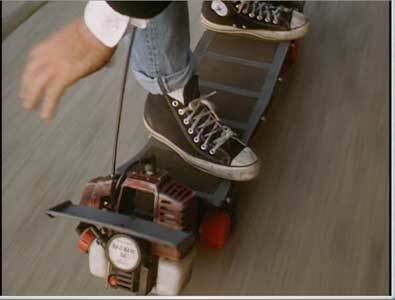 It’s great that the hero of the film wears chucks, while the thrasher gang are seen in other skateboarding footwear. Predictably, the best scenes are the skateboarding action sequences, and the two most memorable are when you see Zack riding Rip through the town trying to elude Ham’s gang, and during a stunt when Zack is able to leap up and skate over a parked car. Zack leaps over a Volkswagen to escape after breaking up Big Dan’s wedding to Maggie. The Skateboard Kid. (1993) Trevor Lissauer, Timothy Busfield, Bess Armstrong, Cliff De Young, Rick Dean, Dom DeLuise, Shanelle Workman. Directed by Larry Swerdlove. Categories: Drama, Teenagers.